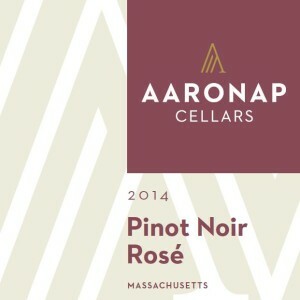 We source our pinot noir from Westport Rivers Vineyard, arguably the best vineyard in Massachusetts for Vinifera grapes. Located just a few miles from the southern coast of Cape Cod, the proximity to the ocean moderates the cold New England winters while providing access to cool ocean breezes during the warm summers. This rose is perfect for picnics or sipping on the deck while enjoying a New England summer day. Delicate salmon color with aromas of strawberries, white peaches, white flowers, & passion fruit. Crisp acidity perfectly balanced by a slightly off-dry finish. Aging Protocol: Sur lie aged in stainless steel. 2014 was a moderately warm growing season in Southeastern New England. The big thunderstorms that marched across the state in July almost daily tended to travel to the north and miss the vineyard site in Westport. Fall turned cool early, which required that the grapes hang on the vine for some additional aging to raise the sugar levels and ripen the grapes. A break in the rain allowed for the grape clusters to be harvested and crushed. After crushing & destemming, a brief soak on the skins provided a light pink color to the juice, which was fermented in a stainless steel tank. Malolactic fermentation was prevented, leaving crisp acidity. The wine was cold-stabilized to 38°F. Finished off-dry for an exquisitely balanced wine.